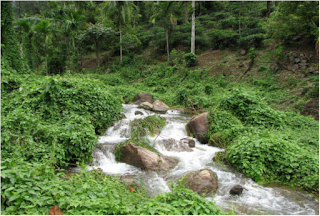 Western Ghats is the catchment area of 3 large rivers, 13 medium and 17 minor rivers which play a crucial role in the rich biodiversity of the region and the prosperity of some 105 million people living in the area. However, these blood lines of the region are under threat mainly from the burgeoning anthropogenic factors in the name of development and flawed policies. According to an in-depth study report submitted to the Western Ghats Ecology Expert Panel about major threats to the riverine ecosystem in the region, dams, mining, tourism, pollution, flawed agriculture practices and deforestation of the riparian cover (forest patches along the river banks) are causing visible degradation to the riverine ecosystems in this World Heritage site. However, K. A. Subramanian who made the study also includes the presence of alien species in the riverine ecosystems in the region as another threat. Alien species, despite their name, do not come from another planet, but are introduced from non-native ecosystems often for agricultural purposes, as ornamental organisms or even as biological controllers. IUCN has identified introduction of invasive as one of the possible reason for the population decline of native organisms. Many of the aquatic invasive species in streams and water bodies in the Western Ghats like Salvinia molesta, Pistia stratiotes, Eichhornia crassipes, Hydrilla and Ipomea fistulosa were first introduced as ornamental plants in aquariums. They later found their ways to the water bodies, now spreading to almost all rivers in the Western Ghats. The changes in the flow pattern and excessive pollution have also helped in the spread of these weeds, especially in catchments which are reeling under the pressure of populated areas. By spreading over the water, they clog the flow of the stream and increase the rate of sedimentation. They cover the water surface, often without allowing the sunlight to pass through, eventually wiping away the submerged species of plants by blocking their chances of photosynthesis. Mikania macarantha, is a similar weed which raises serious threat to other plant species in the streams and riparian ecosystem of the rivers in the Western Ghats. This plant forms a thick layer over the stream and the associated riparian forest blocking the sunlight. It is often observed that the invasion of the Mikania macarantha is closely connected to the presence of degraded riparian forest patches in the course of the stream. For instance, in many places like Agasthyarmalai and Anamali region, the weed has been observed as first colonizing streams using degraded shores in estates and forestry plantations, gradually invading into the healthy riparian cover in the adjacent forest areas in the upstream gradually degrading them over a period f time. Exotic fishes: friend- turned foes? Exotic fishes are another destructive species which is raising serious threat to native organisms in the Western Ghats Rivers. Introduced for aquarium trade, fish farming and as biological controllers, they have invaded the rivers spreading all over the river network in the area. Gambusia affinis was widely used as a biological agent to check the growth of mosquitos. However, their introduction to water bodies in the region paved their way to reaching Western Ghats wide river ecosystems. The species have now reportedly colonized many hill streams, especially in parts of Maharashtra. Though they don’t eat up each and every native species like some other invasive species do, they raise fierce competition for resources with native species, often wiping them away locally. Clarias gariepinus, the notorious African catfish pet named African Mushi among fish farmers in Kerala and neighboring states, has made a bad example of bringing in foreign species for increased production. 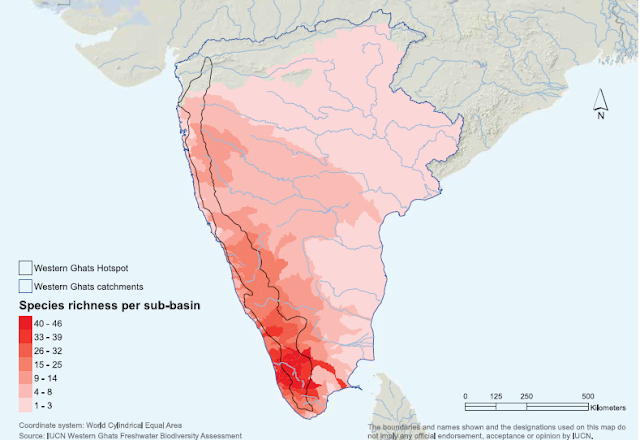 According to an IUCN report on threats on fish diversity in Western Ghats Rivers, Cyprinus carpio, Oncorhyncus mykiss, Pangasianodon hypophthalmus, Oreochromis niloticus, O. mossambicus, Osphronemus goramy, Pterygoplichthys multiradiatus, Piaractus brachypomus, Trichopodus trichopterus, Xiphophorus maculatus, Poecilia reticulata and Gambusia affinis are listed as major invasive threats. Among these, C. carpio, O. mykiss, G. affinis and O. mossambicus are listed among the top hundred worst invasice alien species database. According to IUCN, these dangerous species are more present in the Southernregion of the Western Ghats where the endemism is highest compared to other areas. According to the report submitted to the Convention on Protection of Wetlands, Government of India admits that presence of invasive species has been raising serious threat to the conserved areas in the country. The document also admits that there is no management policy or guidelines issued in this direction. But the government should take immediate actions to make a management policy to check more invasive species reaching to the pristine ecosystems and degrading them gradually. Most fresh water system pollution indicators are Eichornia. Manual clearing is a simple way of controlling the weed seasonally to protect water bodies. The truth about the invasive species is that they could get your lakes or riverine systems eutrophic. High nutrient inlets should be monitored by the Public works department for retaining the river network downflow. Why dragon flies are important to Human beings?